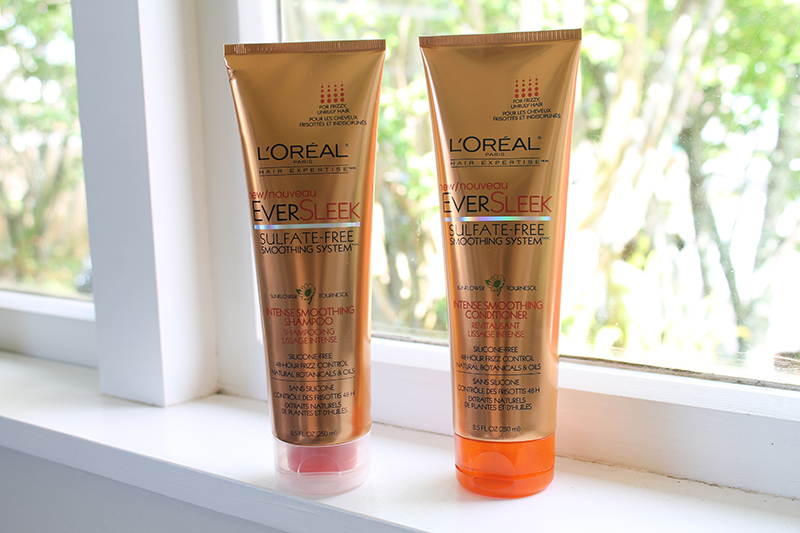 L'Oreal Paris EverSleek Shampoo and Conditioner | emma etc. 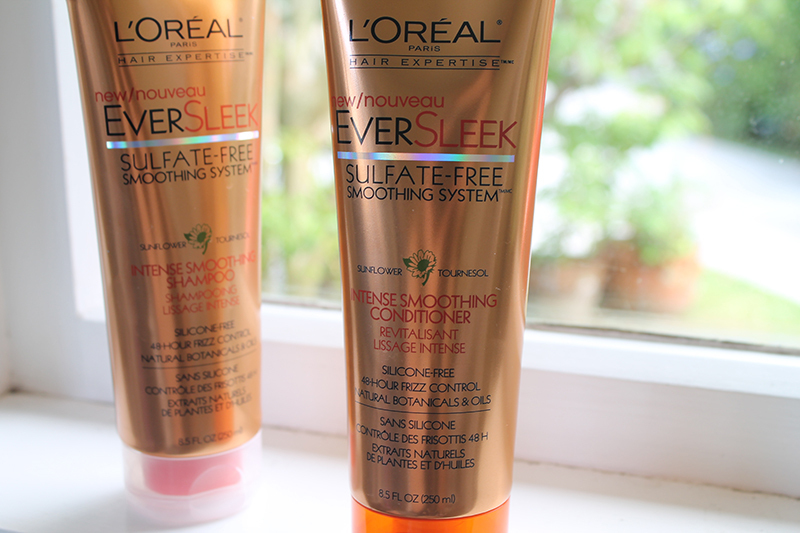 Today I bring you one of L'Oreal Paris' cult range of 'Ever ----', the one I purchased being the EverSleek Sulfate-Free Smoothing System 'for frizzy, unruly hair' that claims to 'weightlessly smooth hair for 48-hour frizz control'. I think having a good shampoo and conditioner is one of the most important things in my 'beauty' routine, and I've been trying this set out a few times, and have come up with my verdict. First of all, though I'm not exactly sure what it means, this shampoo is sulfate-free, but I do know that is a good thing. Basically, it's better for your hair? Starting off with the scent of the product, because we can't miss that, it's what I can only describe as a creamy, beachy, fresh smell that is I personally really like the smell of, it's a far cry from the overly floral and girly scents that you commonly find in shampoo and conditioner. The price of these two are not cheap. They're not overly expensive, but I'm sure you could find a shampoo and conditioner set that do a similar thing for cheaper. When I washed my hair with this in the shower, the shampoo lathered up so thick and nice, and then with the conditioner, it made my hair feel so soft and lovely once it was wet. A while ago I used to blow-dry my hair, but now I'm just sticking with air drying because well frankly, I'm lazy, and from trial and error makes my hair smoother. This could be a factor in how the shampoo and conditioner works for you, in my opinion. While it was drying, I found my hair to be a little more frizzier than usual, funnily enough. But once it had settled down and fully dried, and by the next morning (I wash my hair at night) my hair was really soft and manageable. I think this would be a great duo for everyday hair care if you want hair that has a bit of slip and is easy to style. From shampoo and conditioners I've tried, this is probably one of my favourites, just because it makes my hair smooth and easy to work with, and I'm sure in the future I'll probably try more from their sulfate-free range to see what works best with my hair. Hope you enjoyed reading this, and if you've tried this or another from their range, I'd love to hear about it.